Sonora CA hotel: Celebrate Yosemite’s 125th Anniversary with our Yosemite Getaway Package! September 30, 2015 • By heritagehotelgroup • Posted in Events • Comments Off on Sonora CA hotel: Celebrate Yosemite’s 125th Anniversary with our Yosemite Getaway Package! 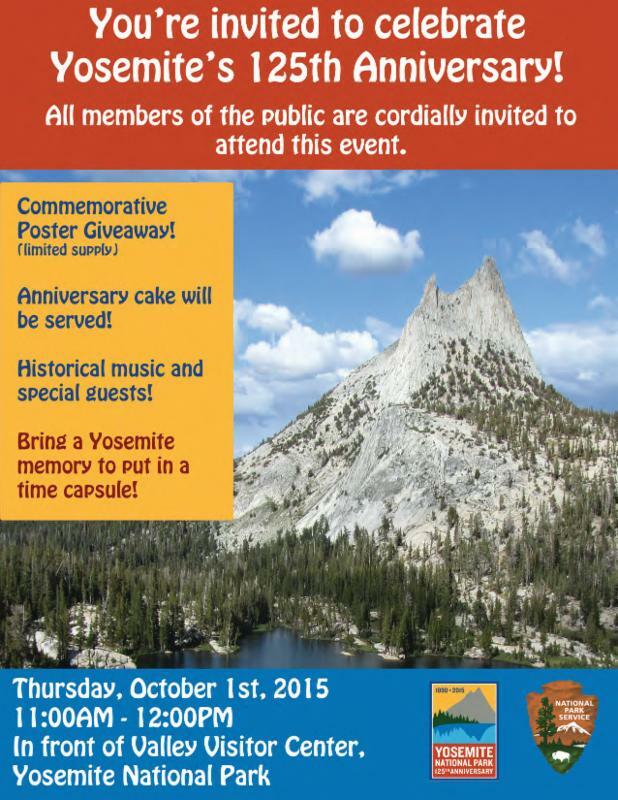 Come and Celebrate Yosemite’s Birthday Celebration Oct. 1st at 11 am. Our hotel in Sonora California is only minutes away from the Yosemite National park. Don’t miss our Yosemite Getaway Package when you visit! BEST WESTERN PLUS Sonora Oaks & Conference Center’s Yosemite Getaway Package! 1 night accommodations in on of our award winning rooms with 1 king bed or 2 queen size beds. Admission into Yosemite National Park for one automobile. Backpack with stuffed Yosemite bear, trail snacks and two water bottles. Image from Yosemite Gateway Partners. Aug. 2015: Winner of $200 Shopping Gift Card and a 2-night Roseville CA hotel Stay: Kristine Ezoski! September 10, 2015 • By heritagehotelgroup • Posted in MonthlyGiveaway • Comments Off on Aug. 2015: Winner of $200 Shopping Gift Card and a 2-night Roseville CA hotel Stay: Kristine Ezoski! We would like to congratulate Kristine Ezovski for winning the $200 Shopping Mall Gift card from Westfield with the two-night hotel stay at the Holiday Inn Express & Suites Roseville Galleria Area in Roseville, California! She can’t wait to go on a shopping spree and would love to visit Roseville California near Sacramento and might have time to discover the best attractions in Roseville California such as Golfland Sunsplash, Thunder Valley Casino, Folsom Lake, Sacramento State Capitol and more while staying at our hotel in Roseville, CA! Sonora CA hotels: Strawberry Music Festival and other Events in Sonora California! September 2, 2015 • By heritagehotelgroup • Posted in Events • Comments Off on Sonora CA hotels: Strawberry Music Festival and other Events in Sonora California! We are excited to announce some awesome events happening in our town of Sonora California! From Strawberry Music Festival, to Labor Day Weekend at Railtown State Historic Park…there will be plenty of events for the whole family! Book your next Sonora CA hotel stay with us! to Westside Park in Tuolumne City! Best Western PLUS Sonora Oaks Hotel & Conference Center will be sold out! Inns of California-Sonora has a special Strawberry Music Festival rate of $79.99 per night for those attending the festival. If you’re going for 1 day or 4 and you’re not into camping, check out the Inns of California-Sonora! Ph. (209) 532-3633. California Statehood Day Parade in Columbia State Historic Park. California became a state on September 9, 1850 – 165 years ago! The Statehood Day Parade in Columbia is sponsored by the Native Sons of the Golden West, Columbia Parlor #258. The Native Sons have a tradition of preserving California History –the parade is a tradition that began in 1876, and was revived in 2008. Parade begins at 11am on Main Street Columbia. Labor Day Weekend at Railtown State Historic Park. Regular excursion train rides depart Saturday, Sunday and Monday. Steam operations on Saturday and Sunday, diesel on Monday. Enjoy live music in Rocca Park on Main Street, Jamestown. The Farmer’s Market is open to the public every Saturday morning from 7:30 am – 11:30 am. Sept. 2015: Win a $200 Gas Gift Card and a 2-night Nevada City CA Hotel Stay! Labor day weekend is near! Celebrate this awesome month and win a $200 Gas Gift Card with a 2-night Stay at the Nevada City Inn in Nevada City, CA! This giveaway is great to create memories with your love ones and do some road trips! May it be a 3-day weekend or any day of the year, this generous gas gift card can help create road trip memories and winner may use to get to Nevada City Inn and enjoy their two complimentary night stay! This Nevada City CA hotel is only a few miles away from the popular attractions in Nevada City including Malakoff Diggins State Historic Park, Empire Mine State Historic Park, North Star Mining Museum, Historic Downtown Nevada city, Alta Sierra Biblical Gardens, hiking, wine tasting, fishing and more! There are countless opportunities for outdoor fun and recreation as well! This hotel in Nevada City CA also features free complimentary breakfast daily, free Wi-Fi, free parking, daily housekeeping, excellent customer service and more!